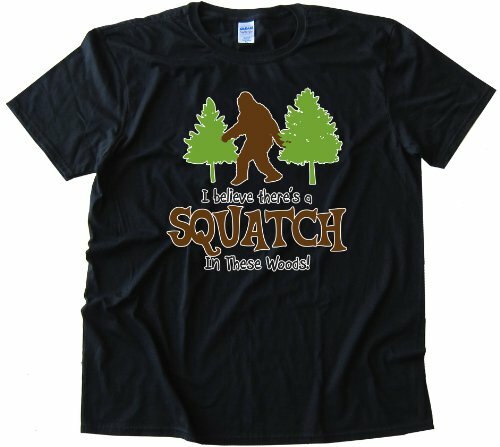 I BELEIVE THERES A SQUATCH IN THESE WOODS FINDING BIGFOOT YET - design printed onto the highest quality fashion white tee shirt for men. Printed on 100% Ring-Spun Cotton and printed with water-based inks for ultra-softness. Euro style fit in neck shoulders and sleeves, Double needle sleeves and bottom hem. These shirts are comfortable, durable and super-soft 4oz cotton! CafePress brings your passions to life with the perfect item for every occasion. With thousands of designs to choose from, you are certain to find the unique item you've been seeking. This standard fit short-sleeve t-shirt features a comfortable crew neck and quality construction, making it the perfect graphic tee gift for both men and women. The soft fabric looks as good as it feels, and this tee is durable for everyday wear. Our cute, funny, and unique designs are printed professionally, and make great novelty gifts for him or her, young or old. And with CafePress, your satisfaction is always our promise. buy with confidence, as we offer easy returns and exchanges and a 100% money back guarantee. CAFEPRESS DOES NOT OFFER PRODUCTS IN THE CATEGORIES OF ROBES, PAJAMAS OR LOUNGEWEAR INTENDED FOR USE BY INDIVIDUALS UNDER THE AGE OF 12. THIS PRODUCT IS NOT INTENDED FOR SUCH USE. CafePress brings your passions to life with the perfect item for every occasion. With thousands of designs to choose from, you are certain to find the unique item you've been seeking. This classic crew neck sweatshirt is the perfect outdoor companion for life's adventures and all your pullover sweatshirt needs. Stay warm and comfortable in this soft 90/10 cotton/polyester blend by Hanes, complete with stretch-ribbed cuffs and waistband to keep the cold out. Our sweats are printed professionally and will make the perfect gift for him or her for Father's Day, Mother's Day, Valentine's Day, birthdays, or any occasion. And with CafePress, your satisfaction is always our promise. buy with confidence, as we offer easy returns and exchanges and a 100% money back guarantee.